“I think you sent this to the wrong person…” my client-turned-friend texted me back after I sent her a text to “come outside.” You see, I’m based out of Annapolis, Maryland and Meg, the texter-backer, lives on a farm in Illinois. Eight hundred thirteen miles separate us; but that’s nothing an early morning flight, and a rental car to drive out of the city and into the rural areas can’t overcome. Meg and her husband Mitch had a long and tumultuous road to their adoption journey. They had been unsuccessful at starting a family through pregnancies and Meg found a blog I wrote about adoption and messaged me because she said she felt we had a connection. And a what connection we had! We often talk about how the universe puts people in your life for a reason and I know that Meg, Mitch, and myself all agree that we were meant to be connected and to be friends. Over the last 15 months, we have laughed together, been frustrated together, and cried together. We will forever be bonded over their adoption, over their faith in me as their doula, and their friendship which means the world. I had told Meg I would be taking my son to a fall festival over the weekend all while secretly conspiring with her sister and husband to show up on her doorstep. I was there as a surprise to attend their baby shower in honor of their amazing little boy Leo. The look on her face when she opened the door to see me standing there was priceless and one I will never forget. After she got over the shock, we sat down and talked like we had been friends for too many years to count… like we had known each forever. We chatted about everyday life, she fussed like every new mom does over a baby who was only slightly upset, and I watched as she comforted her little Leo. I held her sweet little boy and it was, once again, instant connection and instant love. Like Meg and Mitch’s path to adoption, Leo’s story is a little complicated as well. (But really, aren’t all adoption stories?) He was born a few weeks early and he has some thus-far unexplained medical issues going on that have meant getting a g-tube during his NICU stay to help keep his feedings safe. He is not a big fan of swallowing things and there is a risk of aspiration but he’s making huge progress thanks to his amazing parent’s diligence and because he has the brave and fighting heart of a lion. Meg and Mitch stay awake nearly around the clock to make sure Leo is getting in all his calories for his feedings. They are seeing doctors, specialists, and therapists. They are doing adoption finalization visits and check-ins with social workers. Through all these things, they are both smiling, laughing, and holding things down like pros. 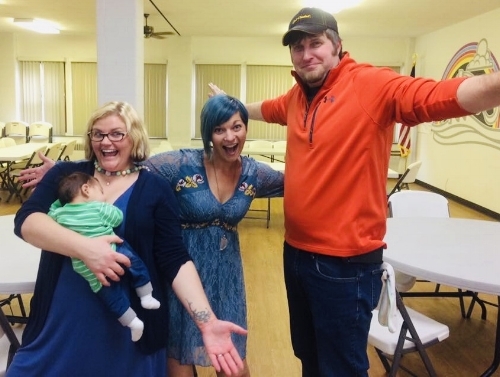 For all these reasons, I was *so* excited to be able to celebrate Meg, Mitch, and the arrival of Leo at their baby shower this weekend. It was “Wish” themed as that was the book that really inspired them to look further into adoption. While the book features an elephant family, Leo’s shower, of course, featured a lion. At the shower, I felt like a celebrity thanks to Meg and Mitch sharing my posted from The Adoption Doula Instagram page. Their family and friends hugged me and made me feel like one of them. We ate some yummy food, we laughed and took silly photos (as evidenced below), and I watched Meg do and amazing job opening gifts even though I knew she *hated* being the center of attention. Doesn’t everyone pose like this for a photo? After the shower, we drove back to the farm and spent the evening talking, hugging a sweet baby, and eating takeout on their couch. It was magical. I feel so connected to this family and as far as I can tell, the feeling is mutual. While there, I totally doula’d them more than I probably should have and made sure to tell them to trust their instincts and that sometimes they had to advocate for not only Leo but themselves too. Doctors and specialists know a lot but as Leo’s parents, they know him best and should trust their gut. After sharing more conversation with Meg over coffee and delicious baked-goods the next morning, I couldn’t stop thinking about the magic of adoption. Through its heart-breaking trauma and loss, adoption still somehow manages to shine and sparkle and ignite lives. Adoption will always be a double-edged sword but as I drove back to the airport, I couldn’t help but feel like the universe had once again delivered sheer magic to everyone who surrounded that adoption. Leo’s addition has allowed Meg and Mitch to be the parent’s they’ve always dreamed they would be. Leo is loved not by one family but now by multiple families. Through an ethical and open adoption like Leo’s, love multiples, not divides. I am so proud to call Meg, Mitch, and Leo my clients, my friends, and friends that are more like family. Soul Sisters bonded by adoption.